Firstly, the splash screen should be quick. How quick? As quick as possible, but never more than 2 or 3 seconds. Why do you think hotels and big businesses spend so much money on their grand and impressive entrances? Because the moment you walk through that door, you know you’re in a place of quality. But my main complaint is that I don’t like using the system. The visuals are very basic and the machine makes a very loud sound with each button press. The interface uses only two colors, bright yellow and blue, the company colors of NS. Firstly, the splash screen should be quick. How quick? As quick as possible, but never more than 2 or 3 seconds. Why do you think hotels and big businesses spend so much money on their grand and impressive entrances? Because the moment you walk through that door, you know you’re in a place of quality. But my main complaint is that I don’t like using the system. The visuals are very basic and the machine makes a very loud sound with each button press. The interface uses only two colors, bright yellow and blue, the company colors of NS. I had to cross swords with my team mate. I had designed a placeholder for the banner just under the navigation, Firstly, the splash screen should be quick. How whereas my team mate had this idea to place some boxes for quick? As quick as possible, but never more than important information instead. And so, I quickly googled for 2 or 3 seconds. a proven answer. Why do you think hotels and big businesses spend so much money on their grand and impressive entrances? Because the moment you walk through that door, you know you’re in a place of quality. 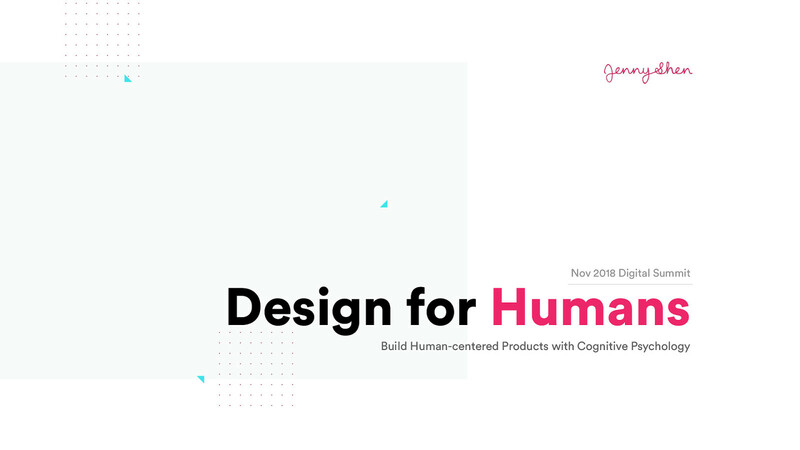 View Design for Humans: Build Human-Centered Products with Cognitive Psychology on Notist. In a time of abundantly available online “design education”, we as designers often find ourselves learning via Medium articles, replicating existing designs or testing half-baked hypotheses. Perhaps it’s time to question if we are neglecting what’s most important—understanding our users as humans. While technologies, tools and mediums change, fundamental human behaviours do last. To make informed decisions at the root of our users’ needs, we need to understand psychology principles that drive human action. This talk explores key psychology principles for designing intuitive products and how to apply them. She’ll also look at the ethical implications of using psychology and the line between persuasion and manipulation. By the end, you will have a deeper perspective of cognitive psychology and be prepared to design more humanely and effectively. Jenny puts presentations on for free. You can too. I love when someone talks about psichology and design ethics in the morning.